Bethany Golden looks into the mirrors in a room where the fittings for cancer patients will take place at the Delaware Medical Campus, 801 OhioHealth Blvd., in Delaware County. Golden’s boutique, Over My Head, provides the monthly fittings on the third Tuesday of each month. It offers headwear and prosthetic breasts for their clients. Golden has a mian location at Riverside Hospital in Columbus. Bethany Golden was 23 years old when her mother’s 11-year battle with breast cancer came to an end. Bonnie Ritchie was diagnosed with the disease at 39 and underwent a bilateral mastectomy in 1991. But her life was difficult when it came to cancer aesthetics. “That was unappealing all the way around,” she said. Ritchie was 50 years old when she died in 2002, the same year Golden graduated from The Ohio State University. Golden, who wanted to help cancer patients such as her mother, studied product development and fashion merchandising. “It was always my goal to create products or had products that were of the best quality so you just felt better at a difficult time,” she said. In 2007, Golden purchased the Over My Head boutique that now provides prosthetic breasts and head coverings for cancer patients and survivors. Five years later, she relocated the business to the OhioHealth Bing Cancer Center at Riverside Methodist Hospital in Columbus. The Women’s Health and Cancer Rights Act of 1998 now provides protections to have breast reconstruction in connection with a mastectomy. The boutique has served 2,500 clients since 2012 including 200 clients from Delaware County, a number that surprised Golden. “(Delaware County has) quite the population of cancer survivors there that not only are being diagnosed currently but that have been diagnosed years in the past that still need prosthetics and head fittings,” Golden said. Delaware residents can now enjoy a shorter commute to receive the same service after Golden started a monthly fitting at the Delaware Medical Campus, located at 801 OhioHealth Blvd., in June. She provides fittings at the campus for clients on the third Tuesday of each month but said the number of fittings could increase. “As it grows, the time that we have there will grow as well,” Golden said. The next session is from 9 a.m. to 4 p.m. on July 18. 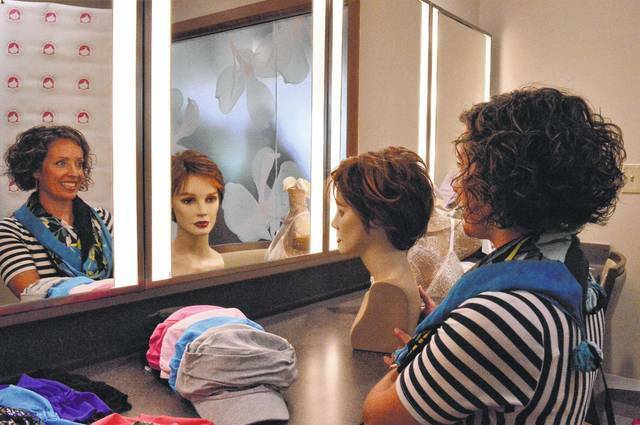 The Delaware campus provides a room that has a few mirrors with built-in light fixtures similar to a traditional dressing room and there are mannequin heads with wigs on display in a corner so clients can preview various wigs. As of Monday, Golden has some clients booked for Tuesday but hopes to have a full day. She typically works with clients a week before the appointment to narrow down their preferences. The fittings last about an hour scheduled for each client. Golden works with her clients’ health insurance and, if needed, the OhioHealth Foundation to cover the costs for the boutique’s products, which are manufactured elsewhere. Hair alternatives include hats, scarves, turbans and wigs that come in different styles and colors. Post-breast surgery clients can get their chest wall digitally scanned for a breast prosthetic that fits like a “puzzle piece,” she said. “We are the only boutique that provides custom breast prosthetic,” Golden said. Her products have exceeded the expectations of clients who are typically nervous, anxious and reluctant about using them when they come in for their fittings, she said. “It has been a great experience,” Golden said. Appointments for a fitting at Over My Head Boutique can be made by calling the Delaware Medical Campus at 740-615-0228.